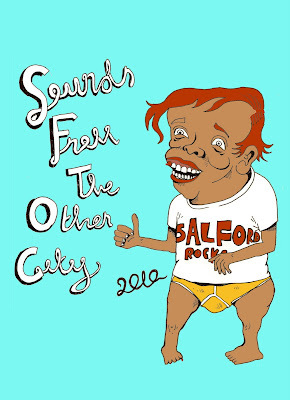 The Shrieking Violet presents the Sounds from the Other City 2010 programme — a souvenir special from Salford — a collaboration with Dominic Al Bhardi illustrations. Featuring stage times and line-ups, clubnights, art, free events, poetry, yarn bombing, churches and cupcakes. Read it online here in a slightly low resolution pdf but with pages in the actual order they will be in in the printed version! A printable, foldable pdf can be downloaded here. 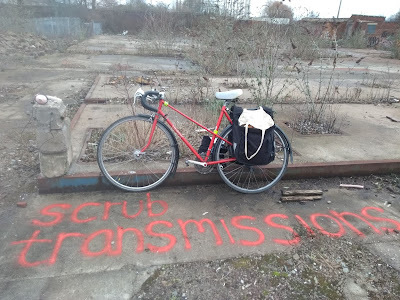 Don't forget there are special art and music events leading up to Sounds from the Other City all this week, and tickets for free events on Sunday, including the telephone phone box gigs, can be obtained from a special box office in Salford Central station. See the Sounds from the Other City website for more information. Sounds from the Other City festival of music and art takes places at various venues on Sunday May 2 and costs £15 (tickets available from Islington Mill, Piccadilly Records and Quay Tickets). For music fans, especially festival-goers, gigs often involve standing in sticky, beer soaked venues. At Sounds from the Other City, however, Salford's annual celebration of alternative music and art, Chapel Street’s beautiful Sacred Trinity Church has long provided the equivalent to a chill out tent, where audiences can sit on the floor or bean bags and relax. Andy Salmon, music fan and reverend at Sacred Trinity, tried to go to Sounds from the Other City in its first year, but it was sold out. However, when the organisers said they needed more venues the next year he saw the perfect opportunity to get involved, offering Sacred Trinity as a stage. 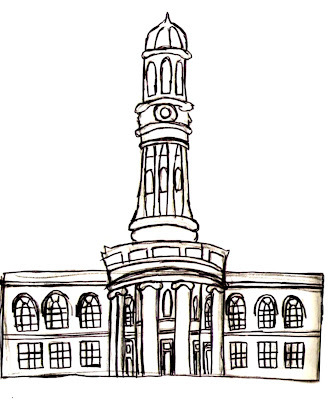 This year, Sacred Trinity’s bigger sister church, St Philip's, a little further along Chapel Street, which was put on Salford’s musical map when it hosted a show by Sugababes a couple of years ago, will be used instead. Members of Andy’s congregation volunteer at gigs, introducing a whole new audience to the music. Andy, a self-confessed beer snob who favours the ‘decent beer’ to be found at places like the Black Lion, King’s Arms, New Oxford and the Crescent, will be bringing in kegs of real ale from Bazens brewery in Higher Broughton, a mile or two away from the venue, and manning a hand pump himself. Bands also use the church for recording, taking advantage of the ‘big-space’ sound it provides, including Delphic, who put St Philip's' organ to use. “What I love is that there’s an interaction between the music and the building. There’s a history and feel to the building that comes from the fact that generations of people have used it. It reflects the hopes and dreams, and also the hurts and pains, of people. We celebrate all of human life here — baptisms, weddings, and funerals. The building has something else about it, and so does music — music connects in a way that often words don’t." Revenue raised from putting concerts on means that the building can continue to be used for future generations, bands benefit from the acoustics and both music fans and church volunteers are introduced to experiences they might not have otherwise had — using churches for music is a win-win for everyone. 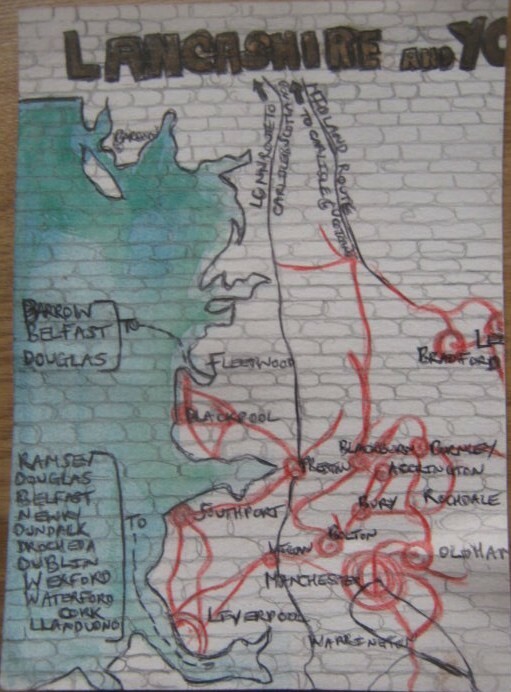 Read Reverend Andy's blog about Salford, the church and bands he's seen. This is an extract from 'The Shrieking Violet presents: Sounds from the Other City' festival programme, which will follow soon! Here is Issue 8 of the Shrieking Violet — a public transport special encompassing trams — Alessandra Mostyn has described and drawn her favourite tram journey, Finglands buses — Dan Russell offers a mini celebration of Finglands buses accompanied by a collage and trains — I visit Manchester's second train station, Victoria. Now it's spring, daytrip season has officially started, and April Preston visits the classic seaside resort Blackpool, whilst rollercoaster enthusiast Dave Robinson recreates the thrill of 'woodies' (wooden rollercoasters) with a guide to Blackpool Pleasure Beach. There is creative writing by Michael Cassidy and a recipe for spicy vegan hot cross buns by Rebecca Willmott. Adam Faulkner offers part 2 of his guide to contemporary French music and Alexx O'Shea reviews a night of electronic music at the Briton's Protection. The cover is by Sophie Wilson, an illustrator currently based in Telford, who has a charming range of merchandise for sale here. For optimum enjoyment, this fanzine should be read whilst listening to the song Choo Choo Train by the Box Tops. Their lead singer, Alex Chilton, who had a number one record in 1967 with The Letter* (an astonishing 1 minute 53 seconds of pop perfection, all tooting horn chords, swirling organ and shimmering strings over Chilton's gravelly almost-blues growl) at the age of 16, went on to form the powerpop group Big Star, who were my favourite band throughout my teenage years (I spent my schooldays trying to learn their songs on guitar). Alex Chilton died at the far-too-young age of 59 last month. I was very sad, so I suppose this fanzine is kind of dedicated to him. The B-Side to Choo Choo Train, Fields of Clover, is also one of my favourite ever songs (actually I think it's quite a lot better than the A-side). Issue 8 can be downloaded here in pdf form. Additionally, paper copies might be left in some of the following places: Good Grief (Afflecks Palace), Koffee Pot, An Outlet, Oxfam Originals, Fred Aldous, Oklahoma, Piccadilly Records, Bread and Butter, Cornerhouse, Manchester Craft Centre, Nexus Arts Cafe, Kings Arms. To have Issue 8 or any back issues* sent to you in the post (free service), email your name and address to Natalie.Rose.Bradbury@googlemail.com. *Here is a page which has the download links of all the back issues too. 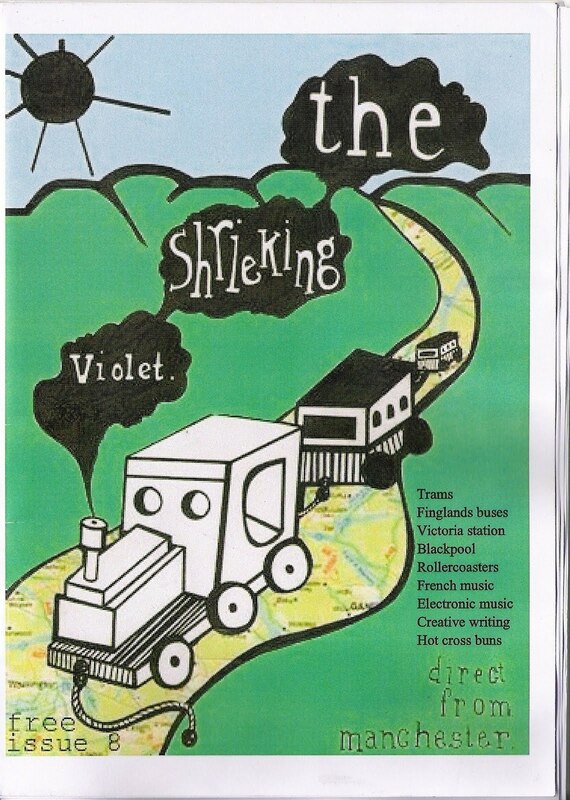 The Shrieking Violet can be read online here, although the pages are in printing rather than reading order. Issues 1-7 of the Shrieking Violet can also be read in Salford Zine Library, which is in the Engine House at Islington Mill. There’s a shop at the entrance to Manchester Victoria called the Good Life Victoria. A sign in the window says ‘We don’t sell cigarettes or phone cards’. It no longer sells anything else either. Polystyrene shapes rest on its dusty shelves next to a faded Mars sign and someone’s been sick on its steps. Unfortunately, it’s not out of place. Victoria is full of empty shop units, and the remaining few – a tailor, and a barbers called The Manchester Cutters with footprints on its thin, handpainted wooden sign (a far cry from the Toni & Guy at its London namesake) which also offers umbrellas at £2 a pop – now, there's a real service in the rainy city, plus a temporary hot dog stall, cling on as if quaint relics from a bygone age. In November 2009, Manchester Victoria was named England’s worst station in a report which asked rail users to rate stations for customer satisfaction (for some reason, the London stations, including London Victoria, a cold, vast, confusing muddle of people, queues leading into forever and contradictory signposting, attached to a big shopping mall, don't come in for much criticism). The report, Better Rail Stations by Chris Green and Sir Peter Hall, describes the importance of stations acting ‘as the gateway to both town and railway’, saying ’they leave passengers with their lasting impressions of both’. The report goes on to set out its vision for the future of Britain’s railway terminals; they should ‘evolve into community hubs, providing local services such as small supermarkets, collection points for undelivered mail, sub-post offices and community services’. This will be based on commercial operations: ‘stations will be considered less as a convenience store and more as a shopping destination in their own right.’ As the report states, however, ‘a dilapidated station is not going to attract strong high street brands or an upmarket store’. Victoria may be dilapidated, but it certainly has glamour lacking from Piccadilly and fitting for a station which was once one of the busiest in Britain. It’s still served by antique wooden ticket counters and interior and exterior alike are adorned with decoration like vines and crowns. Tiles in blue and green announce what were once the book stall, the information stall and the left luggage pool – now adapted for different purposes. The restaurant and bar, packed with families on weekend afternoons, have a high, domed ceiling and stained glass windows, and plaster wreathes and mirrors grace grand red walls. It’s spacious, imposing and classic – although photos on the walls remind of the new Manchester waiting outside – all glass and steel like the Beetham Tower and, indeed, the Piccadilly extension. Another reason I love Victoria is its ambience – the pride with which the historic building relays its destinations and routes makes every journey feel like an adventure. Tiled destination markers decorated with frilly red ironwork on the outside of the building announce towns and cities to the north and east of Manchester, including Leeds, Harrogate, Bradford, York, Bury and Newcastle (although in some cases nowadays you may have to go to Piccadilly instead or take the tram, as with Bury). 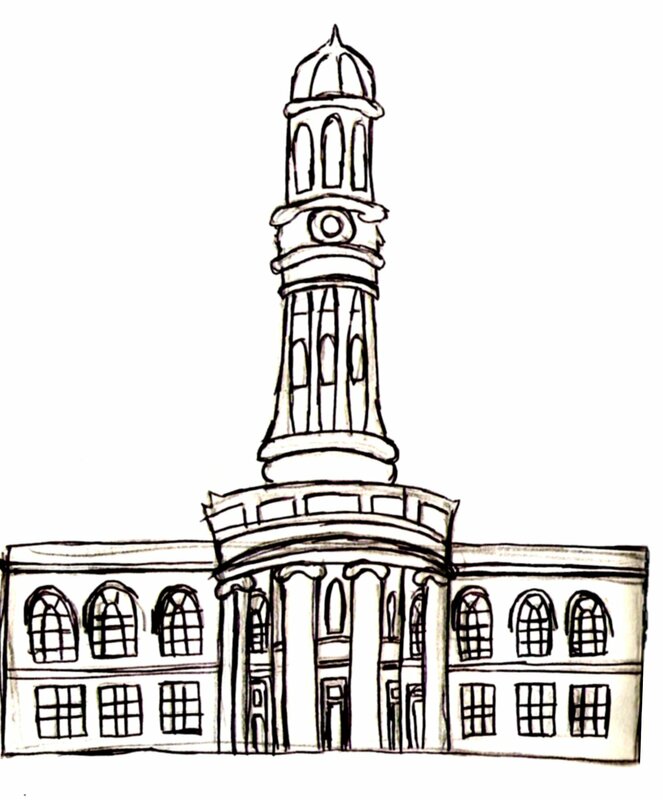 A shell sits atop the corner of the building as if pointing the direction for daytrips to the sea – Scarborough, Southport, Blackpool. Inside, red lines criss-cross a magnificent tiled map* that takes up one of the walls in the entrance showing the routes offered up until 1923 by the now defunct Lancashire & Yorkshire railway, with further options to carry on to Ireland or the continent on steamboats operated by the rail company. Northern Rail has plans to expand and improve the station for the twenty first century, with a £30m refurbishment over the next four years, including a much needed new roof as well as new shops and platforms. It would be hard to begrudge the facilities the report recommends, like pharmacies or car rental, but I’m not sure I’d want Victoria to look like a bland airline terminal – ie, full of overpriced clothes shops and tacky souvenirs, pervaded by an overpowering smell of perfume, yet often hard to find things you actually need. On a recent visit to the WH Smith museum in Newtown, Powys, Wales, I enjoyed reading about how the chain expanded by bidding for contracts for bookstalls on railway routes in the early days of mass travel. In 1848, WH Smith (now ubiquitous in railway stations and airports) won the contract for the London & North Western and Midland railway services (in Manchester, it beat Bradshaw & Blacklock, Bradshaw being the aforementioned George Bradshaw). It had outlets at stations on the railway’s routes, including Victoria, until 1905, when higher rents meant it was hard to make a profit and Smiths started moving to station approaches before eventually expanding onto highstreets. As well as ensuring London daily newspapers were distributed around the country, a feature of these bookstalls was a lending library; at a time of prohibitively expensive fiction, passengers could borrow a book from any station and return it at any other terminal in the country (something which ceased only in 1891 with improved services from county libraries). To make the journey more comfortable, Smiths also offered rugs, footwarmers, candles, playing cards and maps. It struck me, that rather than getting McDonald’s or KFC in to Victoria, it could start with some basics like bins, FREE toilets (unlike Piccadilly, where one has to grapple around for change whilst holding armfuls of luggage), payphones or power sockets for charging mobile phones, warm, comfortable, quiet waiting rooms and city centre maps. With libraries apparently in decline and being shut down across the country, why not bring back lending libraries at train stations, alongside post offices (as recommended by the report) and modern facilities like internet terminals and visitor information? 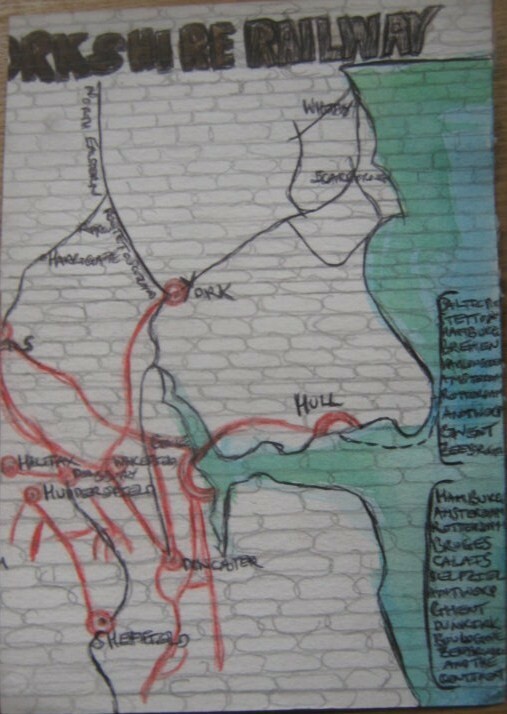 * The only other map I have ever seen that is anything like it is a far smaller tiled route map of the North Eastern railway at Scarborough train station, which also shows the locations of castles and abbeys.